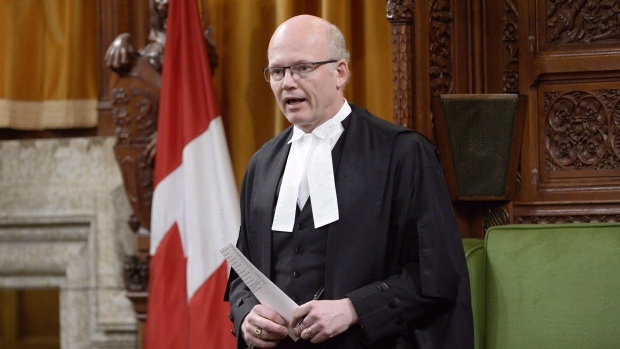 OTTAWA -- The official Opposition is calling for an emergency debate in the House of Commons over the future of Canada-U.S. trade -- but Speaker Geoff Regan is having none of it. Conservative foreign affairs critic Erin O'Toole says Canadians need to see their elected representatives addressing what is the biggest economic crisis in their lifetime. On July 1, Canada is set to impose retaliatory tariffs of $16.6 billion on U.S. products after President Donald Trump slapped tariffs on aluminum and steel, and has threatened more to come on automobiles. "Tariff imposition of this nature would be devastating for the auto industry in Ontario," O'Toole said. "There has never been such a looming threat to the Canadian economy than the threat we're looking at now." Regan, however, has rejected O'Toole's plea. Freeland met last week with Trump's trade czar Robert Lighthizer, and said Canada, Mexico and the U.S. will continue negotiating the North American Free Trade Agreement through the summer. The bid to save NAFTA comes as the fear of a global trade war continues to grow, fuelled by the Trump's administration's plan to impose new tariffs on China that target $200 billion worth of goods. China said today it would respond with "comprehensive measures" that could target American companies.